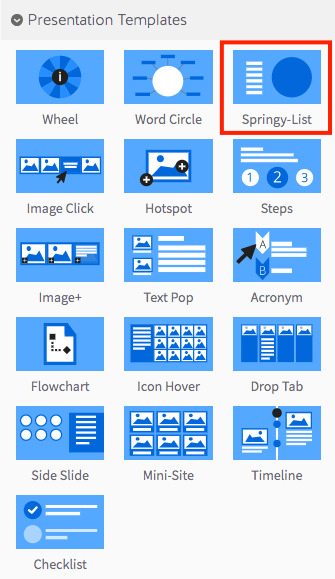 Step 1: Select the Springy-List Template from the ‘Presentation’ panel. Step 2: Drag your Springy-List Template into the Lesson Pathway. 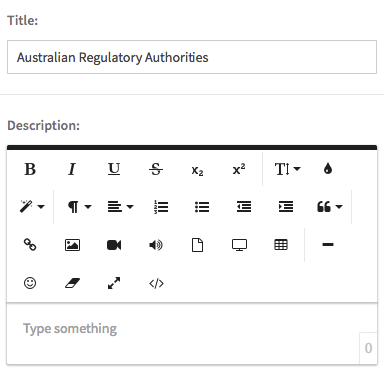 Step 6: Select a layout option for your Springy-List Template. 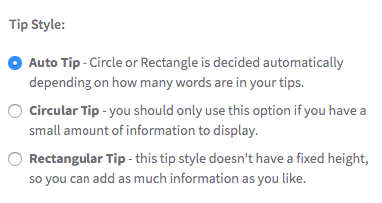 Auto Tip is the default setting which will choose either a Rectangular Tip or Circular Tip depending on how many words are in the tips.The Circular Tip is best for when you’re trying to convey a small amount of information, while the Rectangular Tip is best for displaying longer text. Note: You can also add a background image to your Springy-List Template. Image Tips: We recommend using a full background image for the Springy-List Template, which means choosing an image sized at 1170 x 550 pixels. Step 7: To start building your Springy-List, select the green ‘Add New Item’ button. Step 8: Enter a title and description for your new item. Step 9: When you’re done adding text, select the green checkmark to save your changes. Step 10: To preview your interactive list, click on the ‘preview’ icon.